The 33-acre Golf Studio at Old Palm Golf Club is widely recognized as one of the best practice facilities in the country with its excellent short game practice facility, three full-length holes, double-ended driving range, dazzling views and Club Lounge for relaxing. In addition to spectacular grounds and facilities, the Golf Club also has the latest equipment to help push membersâ games to peak performance. Old Palmâs top-rated instructors utilize the most up-to-date golf training technology available to help even the best golfers improve their games. Old Palm Golf Studioâs indoor hitting bay opens to a driving range to ensure a rewarding experience, rain or shine. The spacious bay includes V-1 technology, with wall-mounted cameras recording a swing from all angles, enabling the instructor to review and analyze the memberâs swing for form and technique. The Golf Studioâs Trackman system, the cutting-edge golf technology that uses radar to track a shot, allows Old Palm members to watch real time 3D graphics of their ballâs trajectory. The other component of Trackman is data collection and analysis. Armed with the two, Old Palm golfers can see exactly how their shot was struck and make the required improvements. Trackman also helps Old Palm pros to adjust club fittings with greater accuracy for enhanced performance by using the data generated from Trackman. This is the same top radar-based club and ball tracking system used by the USGA, PGA and the R&A for swing analysis. It measures a ballâs full trajectory, as well as landing position within 12 inches per 100 yards accuracy. Data on 26 impact and flight parameters is displayed instantly. Smash factor, spin rate, launch angle, carry, ball speed, club speed, dynamic loft, attack angle, club path and face angle are some of the data sets collected and analyzed â giving the seasoned Old Palm golfer solid information with which to set measurable performance goals and work with PGA Professional and Old Palm Director of Instruction Mark Hackett on meeting those goals. 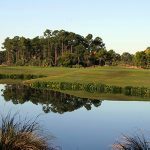 Old Palm Golf Club members who are serious about their game couldnât be in better hands.